Several canoes lie on the Echo Lake beach. Echo Lake beach is in Echo Valley Provincial Park. Mountains add a beautiful backdrop to Echo Lake. The canoes lie upside down on the sandy beach. 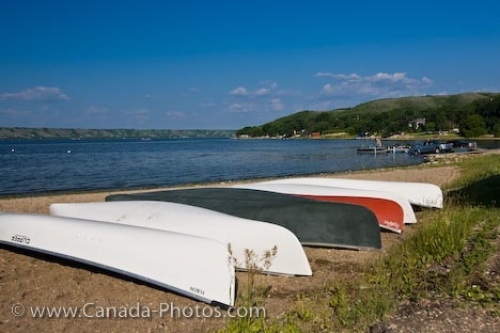 Canoes lay on the beach are ready for the waters of Echo Lake in the Echo Valley Provincial Park.